Using the latest technology, our App has been developed to provide you with useful tax tools and information via your mobile device. Available for iOS and Android mobile phones and devices. 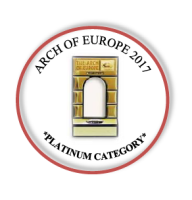 Moustasharoun Bureau earned the "International Arch Of Europe Award in Quality & Technology" in the Platinum Category. The trophy was awarded by the President of the Business Initiative Directions (BID) in the 30th International Quality Conference held in Frankfurt, Germany in July 2017. The Moustasharoun Bureau Newsletter offers an effective way to stay in touch with our customers. It is a well designed and well written Newsletter intended to keep the Moustasharoun Bureau business information fresh in your minds. Over the last 2 years, most of the firms were facing one of their toughest battles yet; against the backdrop of a challenging economy, Moustasharoun Bureau found it crucial to improve its customer service skills in order to meet the customers’ continuous demands. n 2016 Moustasharoun Bureau expanded, through Its first Franchise in Lebanon, to a very promosing area which is the Bekaa District. This partnership brings together a significant financial & taxation services industry experience and extensive technical knowledge of NGO audits.